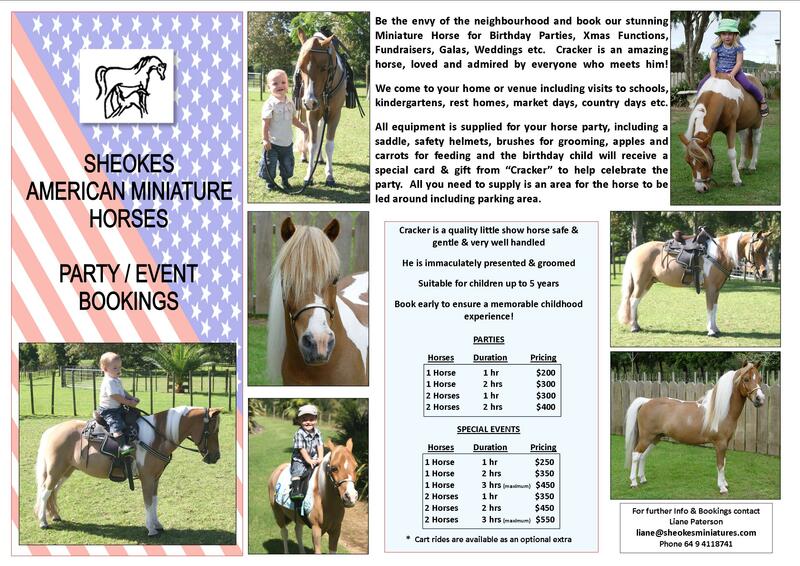 Be the envy of the neighbourhood and book our stunning Miniature Horse for Birthday Parties, Xmas Functions, Fundraisers, Galas, Weddings etc. Cracker is an amazing wee horse, loved and admired by everyone who meets him! He is a quality little show horse, safe, reliable, gentle and very well handled. He will be immaculately presented and groomed. We come to your home or venue including visits to schools, kindergartens, rest homes, market days, country days etc. All equipment is supplied for your horse party, including a saddle, safety helmets, brushes for grooming, apples and carrots for feeding and in the case of a birthday party the birthday boy/girl will receive a special card and gift from "Cracker" to help celebrate the party. All you need to supply is an area for the horse to be led around including parking area for the horse float. Be sure to book early to ensure a memorable childhood (and adult) experience!